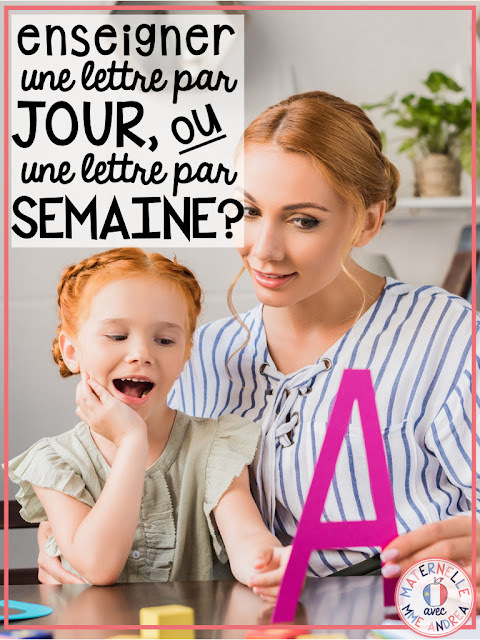 Maternelle avec Mme Andrea: Une lettre par jour... ou une lettre par semaine? Une lettre par jour... ou une lettre par semaine? I am here today to discuss kind of a controversial topic! I get asked all the time how I teach the alphabet to my students, so I thought that I would share with you my number one alphabet teaching tip today. It is not something that everyone agrees with, and many maternelle teachers do it differently. And that's okay! This blog is all about me sharing what works for me in my classroom - I absolutely do not think that I am an expert about what works for anybody else. I once heard a teacher blogger say to think about her like Walmart (or Target, if you're lucky enough to have one of those nearby), and you can think about me the same way. Stop by, browse around, and pick up one or two things to take with you on your way. You don't have to try evvvvvverything that I suggest, or ever feel badly if you do things in a different way. I don't judge other teachers - we are all just doing our best! And this blog post is all about what I have found works best for me and my students when teaching the alphabet! So, one question that often comes up when I am talking to other teachers is if I teach the alphabet a letter a day, or a letter a week. And I am very firmly in the one letter per day camp. If you do a letter a week, that's totally up to you, but I would like to invite you to continue reading my post and then reflect a bit at the end to see if a letter a day may work better. In my experience (I did try a letter a week my first year), teaching and practicing just one letter per week is too slow. If you do the alphabet this way, you don't even get to the last letter before March. In March, 2/3 of the school year is already over! You may feel that slow is good, and taking a whole week to focus on a letter will help those who take longer to learn their letters. But, honestly, generally our students who need a lot of time to learn each letter still aren't going to master them in a week. And what about your students who don't need a whole week (which is most of them!)? You're holding them back. If you have a student who knows all their letters in September (or a student who is able to remember and identify the majority of them right after you teach them), how are those students going to feel about the alphabet come March, when all of their "instruction" has been what they already know, or would have been able to learn much faster? And, honestly, many of our students who struggle to learn their letters will likely struggle whether you teach them over a day or if you take a whole week. Plus, if it takes until Friday for them to learn a letter, they will often forget it again by Monday! Not to mention the fact that September and March are very far apart - letters learned in September will probably be forgotten by our struggling students come March. In my opinion, our students who struggle to learn their letters need different help - not just more whole-group exposure. And all of our students need spiral review of all of the letters all throughout the year. Otherwise, they will forget what isn't 100% mastered. 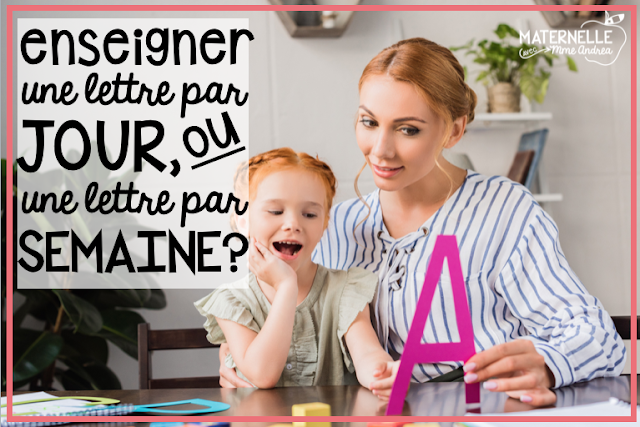 Plus, it is unfair to expect your students to complete activities and even play games that practice the whole alphabet until they have been exposed to and explicitly taught every letter. March is very late to start this kind of practice! You also can't fairly evaluate your students on which letters they know until you have taught all 26. That means that you can't *really* identify struggling students and talk to your resource teacher or to students' parents about extra help at home until March. Again, that's late. Students who are behind need as much time as possible to review and practice so that they can really get these concepts mastered. So, here is what I propose instead. Start the year with a LOT of alphabet exposure. One letter a day for the first six weeks or so (I do a new letter each day Mon-Thurs and then review the letters we have learned on Fridays). Do a variety of activities with each letter all throughout the day - boot camp style. During the first round, I focus as much as possible on the sound each letter makes orally. I show them the letter and what it looks like, but the focus is on what each letter says, an anchor word that begins with each letter, and what we do with our mouths to make each letter sound. At the end of the six weeks, quickly evaluate who knows which letters and sounds. You can then use this information to create small groups. Students who know all or most of their letters and sounds will be ready to start to learn to read. Students who still don't know any will need targeted intervention from you - ASAP! You can group students who know a handful of similar letters together and really give them a boost on the ones they are missing by working with them in small groups, right away. After my students are grouped and we are working together in small groups, I still do another round of the alphabet whole-group. We focus on something different (usually correct letter formation), and the repeated exposure helps solidify the letters they learned during round one, and generally teaches them a few more. Plus, they are focusing on something new related to the alphabet, so it's not boring. Depending on my class, we may do a third round, but I will usually move off into more intense sight word practice after Christmas - but not always! Last year, we were still working on writing our letters correctly right up until June. Please let me know your thoughts about this, or if you have any questions at all - you can write a comment below or fire me an email. I really do believe strongly in this one, and have seen a lot of improvement with my students when we moved faster through the alphabet. Lots of students need longer than a day per letter to learn every letter, BUT many of them can learn most of their letters by seeing one per day. And, in my opinion, the best strategy for helping them learn the letters they miss is in small groups. I would love to share more about what I do with my small group students who need extra alphabet help, and what a day of "alphabet boot camp" looks like for us in September. Until then, you can check out this post about how I start the alphabet (orally), along with a few other ideas. I also have this post about our "routine de calligraphie", which is generally our second or third trip through the alphabet. I also send home flash cards with my students as we learn each letter, for extra practice. I don't send any worksheets for homework - ever! You can read all about that in this blog post. Quick & Easy Bathroom "Passes"